Me… a pro… nice that you think of me like that! But back to the topic: overall a very nice approach but there a few things i think you need to change. The atmo is to seethrough when you look down at it. Dont filter out the fresnel in the middle to much! The edges on the other hand look quite nice! The ocean is to smooth. In reallity the reflection is quite rough and not so sharp and its also a little more homogeneous. The clouds are definitely missing. If you have problems with the normals facing inwards just flip the normals of the cloud sphere with “Shift + N” and test if you have to click inside to get them visibile (maybe just recalcutating them is enough)! Stars are not visible when fotographing the earth because it is to bright, but if you want to keep them thats cool too. The “reylight” (its rayleigh, the name of the dude who invented it) scattering looks pretty good! How did you fake that? Of cause you are a pro, I looked into your shader and the only thing I understood in there were the Volume Scatter and Absorbtion nodes. I didn´t really understand what you meant. Is the atmosphere too dense or too light when looking down on it? 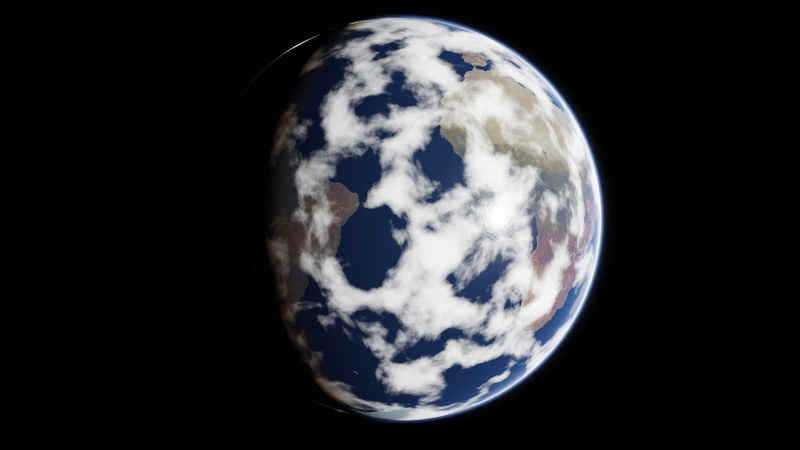 I used some different textures for the earth now, decreased the roughtness of the water a bit and used a noise texture as the normal for the water. What do you think? Of cause, These Clouds don´t look really good cause they are just a noise texture, but they are better than nothing in my opinion. You can also see what I meant by weird shading artifacts now if you look closely at the poles. Removed the stars, they were unrealistic and they created artifacts. Of cause, rayleight… what a noob mistake! I created by using a diffuse shader converted to rgb, which went into a Color Ramp to Control the Colors. I think you shouldn’t be cluttering up someone else’s thread with your own work. and can confirm. gettin those pretty renders. thanks again mate for the great work! this shader is terrific. Do you have a patreon or anything for taking a donation?